I was getting ready to attend a dinner theater performance of I’ll Be Home for Christmas*, being held at a nearby church. 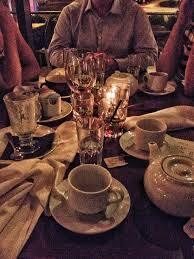 Had the evening been a date with my husband as originally planned, it wouldn’t have mattered where we sat. But Steve was in bed with a virus, leaving me to attend alone. I couldn’t use Steve’s illness as an excuse to stay home. Our daughter was one of the dancers. I had to be there; I wanted to be there. God answered my prayer. No one knew each other at my assigned table, and we spent a delightful hour becoming acquainted—no conversation-monopolizers or negative Nellies in the group. A couple at the table, Larry and Susan, knew one of the teachers from the school where I taught. I scurried back to my original table, expressed my pleasure in meeting everyone, and explained where I was moving and why. Later, when Heather and the other dancers performed, she was right in front of me much of the time—with no obstructions. Thank you, Lord, for blessings not even asked for, I whispered. The entire production was over-the-top wonderful, with an engaging script, a well-directed and thoroughly rehearsed cast, and a delightful score. In addition, everyone on stage seemed to be having as much fun as the audience. But I could tell hours of time had been expended to coordinate the various elements: costumes, set design, actors, dancers, singers, lighting, sound etc. The script also required impeccable timing for certain scenes. No doubt they had practiced again and again to get it just right. Wouldn’t it be amazing to work on such a musical at our church, I mused. But no way that’s going to happen. Our music ministry was in need of a new director; the interim (though trying valiantly) was barely keeping us going. The choir had dwindled by half. We weren’t even doing a cantata that year. But several weeks later, a dynamic director named Dixie accepted the vacant position, and attendance immediately improved. A few weeks after that she announced we would perform a musical for Easter. Oh, no, I thought. We’re not ready! But it turned out we were. It took a few Saturday rehearsals and longer choir practices on Wednesday nights, but I don’t remember anyone complaining. The extra hours developed stronger camaraderie among us, renewed our confidence, and bolstered our faith. Dixie showed us that all things are possible with God—even Easter musicals memorized in six weeks! 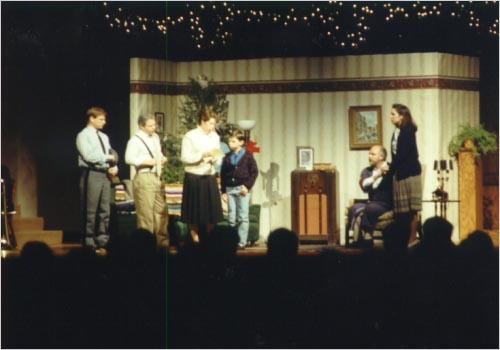 Several years later in August, Dixie announced the musical we’d perform for Christmas. And guess what script she pulled out? Yup. I’ll Be Home for Christmas*. The Lord does indeed fulfill the desires of those who fear him (Psalm 145:17)– desires beyond probability, beyond hope, beyond what we ask for. 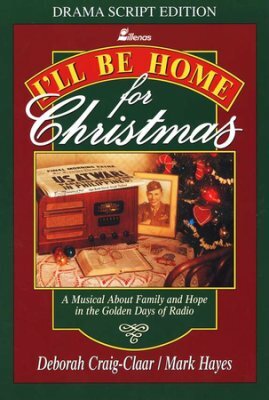 *I’ll Be Home for Christmas, by Deborah Craig-Claar and Mark Hayes, Lillenas, 1994. Photo credits: www.jointhedinnerparty.com; http://www.nph.com; http://www.christianbooks.com. Such wonderful memories evoked with this one, Nancy. Loved every moment the music/drama department allowed this decidedly non-singer to participate in your goings on. Love to you…Merry Christmas! You made a great plumber, Ginny! 🙂 Love to you also, dear friend, and a Merry Christmas to all the Shireys! I so enjoy stories like this, Nancy, where it proves once again how well our Heavenly Father loves us and longs to give us good gifts. I can also tell you love to sing and worship–what a great story. Worship singing has been a favorite activity of mine for many years, Jody! I’ve collected glorious memories of music ushering me to the very gates of heaven, in wonder and gratitude. And in my opinion, Christmas would lose much of its luster without the beloved carols–old and new! I thoroughly enjoyed this story, Nancy. Love hearing about your real experiences as you served the Lord throughout the years. You can’t make up stuff like this…as they say… Watching the Lord engineer things to come full circle years later… How Wonderful! I’m so glad you enjoyed this post, Cheri. You are so right: watching God engineer events is a wonderful, faith-building experience. I’m also thankful for my blessings journal in which I’ve recorded events such as these–at least in summary form. The entries on which this post is based even included the names of the couple who knew Diane (the school colleague of mine who attended the same performance). I didn’t have to get creative–Larry and Susan were their names! How delightful for me that I could make your evening, Jean! And yes, God does amaze and surprise frequently! Holey moley, what a WONDERFUL story, Nancy. I loved very word of it! I miss musicals — we did several at our former church and a few musical-like things at our current one. But not in a very long time. To tell you the truth, I hadn’t missed them much . . . until I read this. Thanks for the good reminder, my friend. Thank you, Diana. I miss those musical-days, too! But a new chapter of life has brought new pursuits that I also enjoy. Life is just too short to do everything I’d like to do!